This week's challenge on I Heart Faces is Slice of Life. I immediately knew I wanted my picture to portray a slice of life in Moldova, and this picture is one of my all-time favorites. I took this at the market here in Orhei, and I was just so impressed by how this lady got all gussied up every day with her pearls and fancy updo to go to the market and sell cuts of raw meat. I edited it with CoffeeShop Simply Vintage, and I just love everything about it. 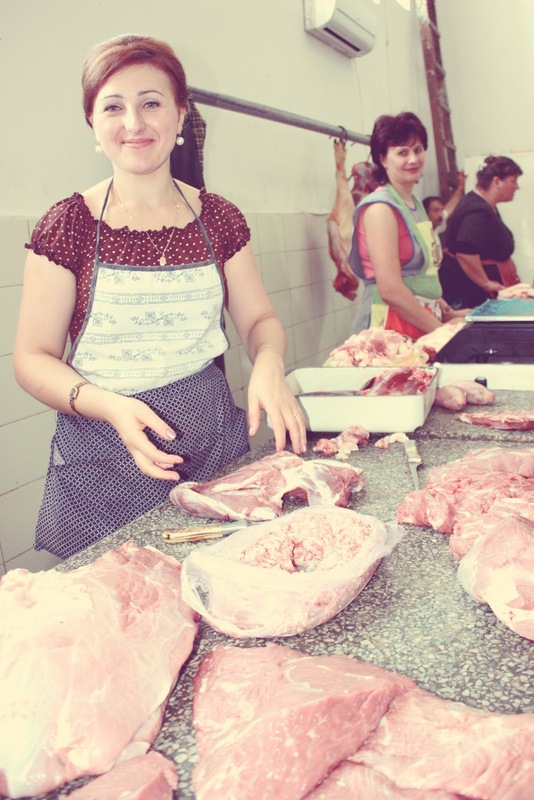 So, here you go, I Heart Faces, this is a very common slice of everyday life in Moldova! Great capture, the editing really adds to the mood of the shot, well done! Very cool! Love the editing! This is a very pretty picture and a beautiful woman. Fantastic image, love the processing, great entry choice!! I don't look that nice when I go to a wedding! Great slice of life. How cute is she in her fancy stuff selling meat?! Great shot! I love this and the edit is great! Perfect choice! This is real life captured at it's best, and with pearls. This is so neat! Very retro! Nice! Love the effect and retro feeling you added to this photo! This lady is a gorgeous example of no matter how "unglorious" our jobs can be, we take pride in ourselves and a job well done!